As mentioned in our Shape Flower Garden post earlier this week, we are enjoying spring fever and are in love with flowers! Since our house is a disaster because of our current remodeling project, we especially love anything that smells nice and is pretty! 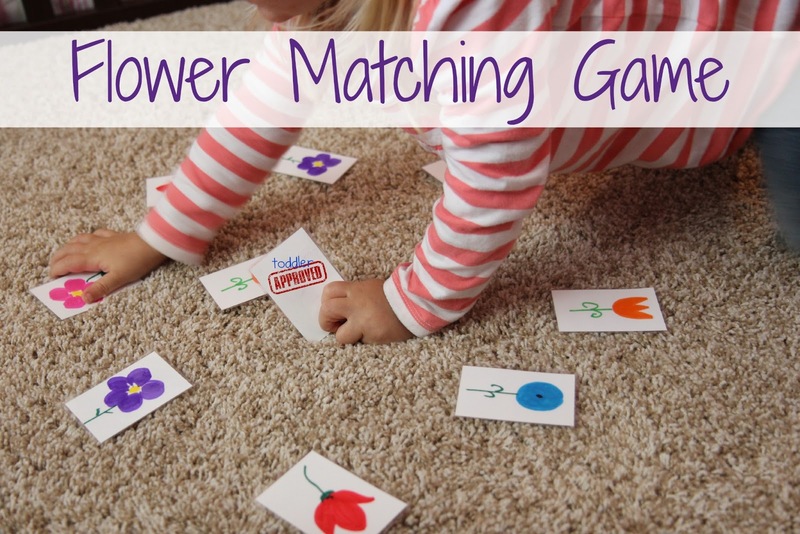 This flower matching game was a simple way to get our minds off of the craziness in our house this week. Here's a glimpse of what our playroom and dining room currently look like... (we haven't played in the playroom in almost a month because it is too loud and cold). My toddler usually has independent quiet time in the late afternoon in her room while the baby naps. Since our house is filled with unfamiliar people and new loud sounds as we remodel a good portion of our upstairs, quiet time has turned into mommy/daughter quiet activity time in the kitchen. I love creating things that can be used in several ways and are durable, so the other day I made some flower cards which we have been using for hunts, matching games, sorting, and memory games. Nothing too crazy or unique, but these cards kept us busy for awhile! I cut up some paper using cardstock, drew several matching flowers on them with markers, laminated them (you could also use contact paper), cut them out, and then we started playing with them! First we played by having all the cards face up and spread out on the carpet. I shuffled the cards and made sure matches were far away from one another and then I challenged my toddler to find the matching pairs. She grabbed each pair and grouped them! We talked about colors and flowers and shapes while we played. Once we did that again and again... then we attempt to play traditional memory and turn them face down and choose one pair at a time (trying to find matches). That proved to be way too hard for her (she is about 27 months), so we hid the flower cards around the room instead and tried to "hunt" for the matching pairs. When my 5 yr old got home from school he had a blast playing traditional memory with me and then the toddler and I also did some silly activities using our Princess Little People. I called it "Princesses in the Flower Garden" or something goofy like that. We put all the cards face up and then I would challenge my daughter to put her Snow Whites on top of the two pink flowers or put all the princesses on the tulips, etc. You could easily add simple sight words, rhyming words, numbers, mathematical equations, or alphabet letters to these flower cards if you wanted to kick it up a bit and make it for challenging for older kids. Not only were the different versions of this game great for talking about colors and working on visual discrimination, they also provided good opportunities to help my toddler practice using her words to express her feelings- excitement for making a match, frustration when memory was difficult for her and she needed help, etc. If your child isn't a fan of flowers or you don't want to draw your own cards, you could easily make cards using your favorite set of stickers or scrapbook paper. How else could you use these cards with your child? What topics are they interested in right now? Have you ever done a live-in remodel? What were simple ways you kept your kids happy and occupied when your house was under construction? We've been in a live in remodel, it feels like, since the boys were born. Our home had been unoccupied for over a year when we bought it and had never been updated forever! My husband has done a lot of it but it is always hardest when a lot of strangers are in the house working on one particular project -- one thing I had to do was make tool belts for my boys and let them fill them up with their tools and then I gave them areas to "work". They tend to want to follow the workmen, touch their tools, or try to sit in their laps or something! ha. Good luck with your remodel. I bet it's going to be beautiful. Love all the windows in your home!